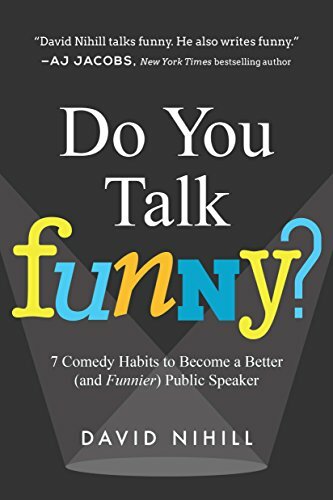 REVIEW: DO YOU TALK FUNNY? David Nihill’s number-one fear used to be public speaking. It’s not an uncommon fear, but it was one inner demon Nihill felt compelled to knock flat. Unlike most business people Nihill did not join Toastmasters or any other group focused on helping business people develop the confidence they needed to speak before an audience. Nihill chose, instead, to take to the stage as a stand-up comedian for a year. During his trial year as “the comedian called Irish Dave” (as well as other stage persona), he crashed comedy clubs, festivals and assorted shows. He stood up on stage and yucked it up with the crowds. Irish Dave hung out with some of the finest up-and-coming funny people in the business and he learned from them. In between the performances he studied the old masters and watched new ones plying their trade. From them he learned about constructing stories and finding the funny in them. He studied delivery and timing and pacing and about how to control an audience. He learned all of this from working performers who were mastering their craft in the traditional, time-honored way – by just doing it. This You-Tube video, which was published in October, 2016 by FunnyBizz Conference and features Nihill discussing “How to Become a Better and Funnier Speaker.” It was part of a workshop developed by CreativeLive. Before embarking on this adventure, Nihill had worked as a consultant for start-ups. He was between jobs, having just left a well-paying corporate one, and he was unsure about his next move. The impetus for climbing onstage despite his self-confessed crippling fear of public speaking was fueled by a desire to help his friend Arash Bayatmakou who had sustained a severe spinal cord injury. It was Nihill’s idea to organize a comedy show and recruit comedians to raise funds for his friend’s continued physical therapy. The show came together handily with the help of a neighbor who happened to be a professional comedian. However, Arash (unaware of Nihill’s personal demon) asked that David host that show. Nihill had to try. He had to learn to confidently stand up there onstage. Fast. Compared to the reality his friend was facing, he thought, Nihill’s demon was really a very small thing. But, the standard methods of learning how to speak well before a crowd looked like a quick route to seppuku. Another friend, hearing about David’s predicament, got him a 20-minute gig in a paid show. Nihill went for it. He did not do too badly, he thought. He even kind of liked it. After that fairly easy baptism of fire, he was even able to pull off emceeing the fundraiser for Arash. Nihill, at loose ends anyway, decided to keep the exploration of comedic method going for a year. He approached the whole proceeding as a research project, mostly because he did not want to explain to friends and family that he was postponing a more serious job search in order to go tell jokes. Besides performing onstage all across Northern California at many of the top comedy clubs as an “accomplished comedian,” he interviewed, observed and read about several thousand comedians, performers and public speaking experts. He tracked down every book and quote and guru he could find. He collected their thoughts and tips. He broke down the techniques and did a Tim Ferris on them, deconstructing each skill he wanted to master into its most basic components. He applied and tried them out during his own performances. He improved. Along the way he also began to figure out the most effective ways to gussy up all those yawn-inducing Powerpoint presentations and business conference talks that hit the snooze buttons of every person who ever had to attend those interminable meetings and gatherings. By the end of his year of performing, Irish Dave and his alter egos had garnered accolades and assorted wins at various competitions. David Nihill was an accomplished public speaker by then. In the course of things, Nihill put together Funny Bizz, an online support group that grew into a community, a conference series and a writer platform that helps business content creators tap into the power of storytelling, comedy and improve to create better content. The Comedy For A Spinal Cause fundraiser that kicked him onto the stage went so well it became an ongoing quarterly event that brings top comedians together with local communities to raise funds and awareness to help people who are recovering from spinal cord injury. Nihill also helped his friend Arash become a powerful speaker in his own right. Oh yeah…and he wrote this book…. I do recommend this lively, well-thought-out, and use-able book for anyone who needs help sparkling up their monologues or their content writing. The “Tipliography” collection of 80 tips and hacks from the book and from the comedians Nihill interviewed is worth the price of the book. 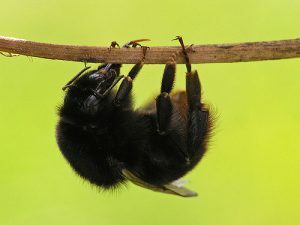 It’s a funny thing, the bumblebee. It just opens up wings and flies. And, anyway, it is not flying right. These same guys will come after you too. Be a bumblebee, my friend. Anyhow, you’re not doing it the right way.